Police will not carry out their own investigation into expenses claims made by the former chief executive of Welcome to Yorkshire. 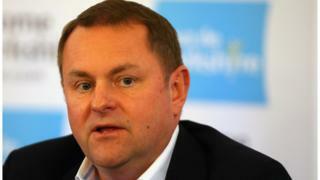 Sir Gary Verity paid back £40,000 before resigning on health grounds last month. West Yorkshire Police said it would await the findings of an independent investigation commissioned by the tourism company. Lib Dem peer Lord Scriven said he was "astounded" by the force's decision. Last month the former leader of Sheffield City Council wrote to the chief constable of West Yorkshire, asking for the force to investigate expenses claims made by Sir Gary. A force spokesman said that following a meeting with Welcome to Yorkshire representatives it had agreed the full findings of an independent review will be shared with the force. It added that if any evidence was identified of criminal offences it would be brought to their "immediate attention". Responding to the decision, Lord Scriven said the force had "taken at face value the word of the very organisation who have overseen the poor governance and financial control that has led to at least £40,000 being claimed when it shouldn't have. "I feel the force haven't carried out their duties in full and I will now consider referring this matter to the Independent Office for Police Conduct." Earlier this month, Welcome to Yorkshire announced it would commission two independent investigations into Sir Gary's tenure at the company, which has received millions of pounds of public funding. At the time of his resignation, it said Sir Gary resigned on health grounds but an investigation found he had "made errors of judgement regarding his expenses". Responding to the claim he repaid £40,000 in expenses before quitting, a spokeswoman for Sir Gary said: "Expenses were submitted in the ordinary course and signed off. "However, on review it was agreed that some errors had been made and Sir Gary was content to agree to voluntarily reimburse Welcome to Yorkshire for monies owed."